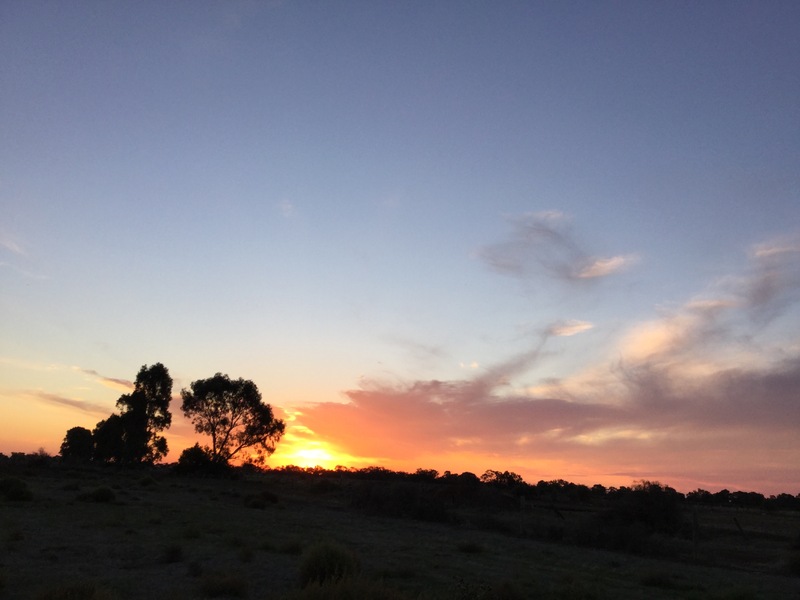 We left beautiful Seymour on Tuesday morning and travelled up to Cobram. Our plan is to spend some time exploring the towns along the Murray River. 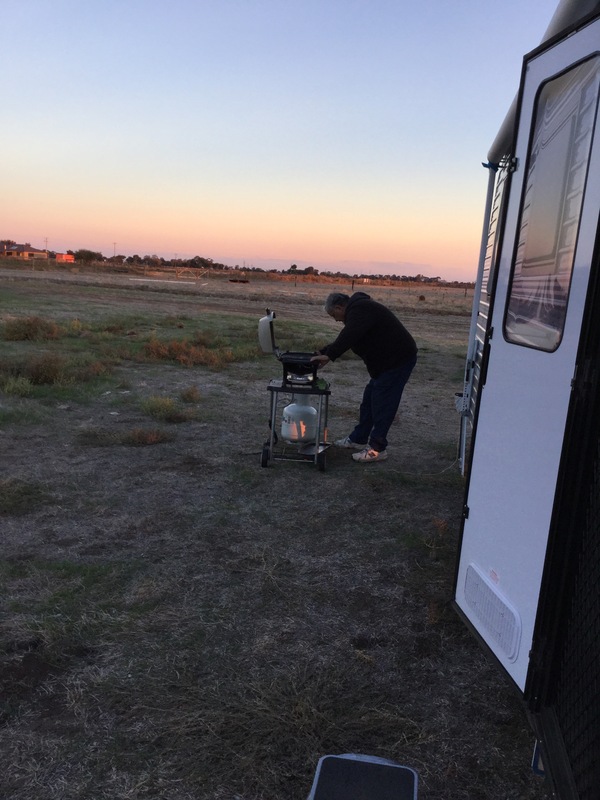 Tuesday night was spent at Cobram Willows Caravan Park. It was very pleasant and this was the 5 th night in a caravan park. Parked next to us were a lovely couple from Sussex Inlet. We had happy hour and exchanged stories and phone numbers. We hope to catch up again soon. On Wednesday morning we pushed off about 10am heading to Swan Hill, Victoria. We went to Finley then took the Riverina Hwy to Deniliquin then took the Wakool Road. We came across a cute little town called Wakool (pronounced Warcool) where we stopped for lunch and had a chat with the locals. We passed through Barham and arrived at Kerang. 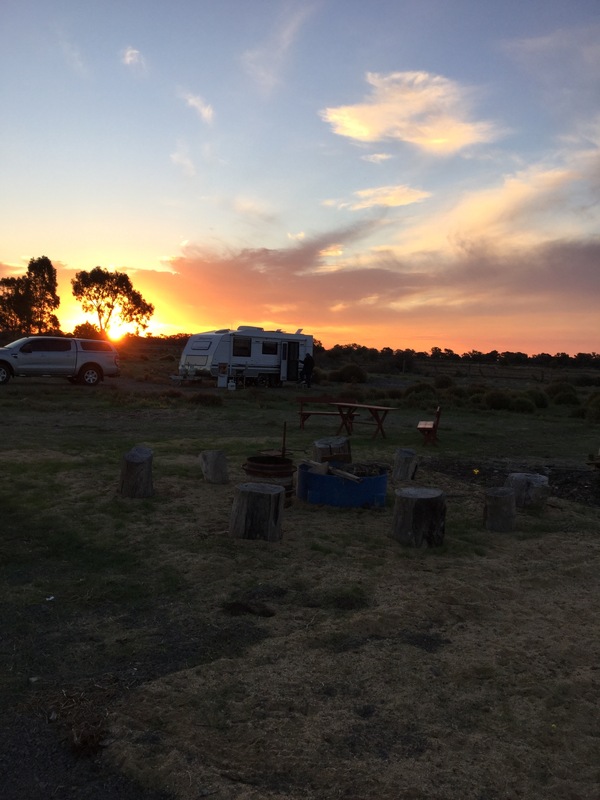 At Kerang we found a great ‘free camp’ spot at the back of residential homes. A wonderful couple, Beth and Rex, have opened up their acreage to campers free of charge! Yes, it’s free, off the road and secure! They are even happy for you to fill your water tanks before leaving. Now that’s what I call generosity. But wait, there’s more! They have set up an area for a nice fire with some stumps to plant your bum on and the fire wood is also supplied along with a wooden outdoor setting and a portable loo, too! This afternoon Beth and Rex came over to introduce themselves and handed us 1/2 dozen eggs, fresh from their free range chooks. Now, how generous can you get! Would you believe that they are fighting the authorities to continue to keep the gates open! …….what is the world coming to? We left our van at the free camp and went into Swan Hill to pick up information and have a bit of a look about. 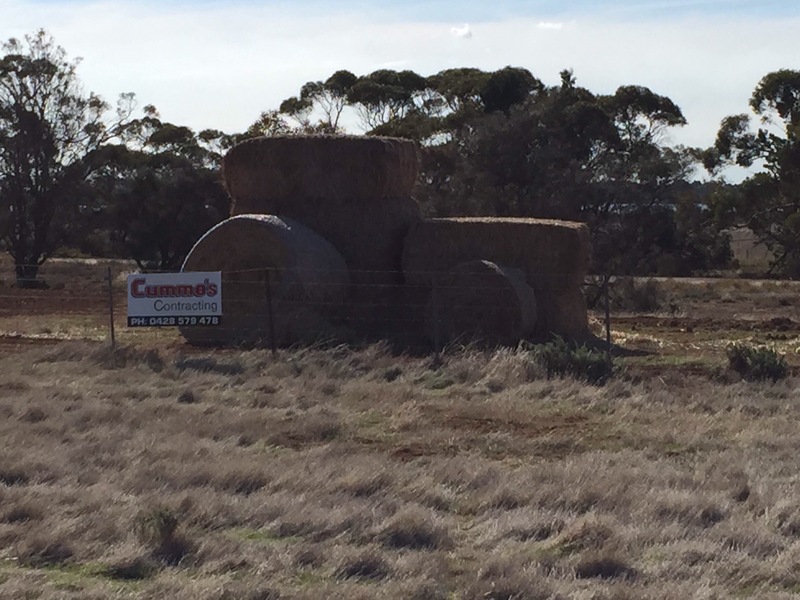 The residents are having a fun time creating a bit of roadside art using hay. It certainly breaks the journey. Thank you for the exhibitions. 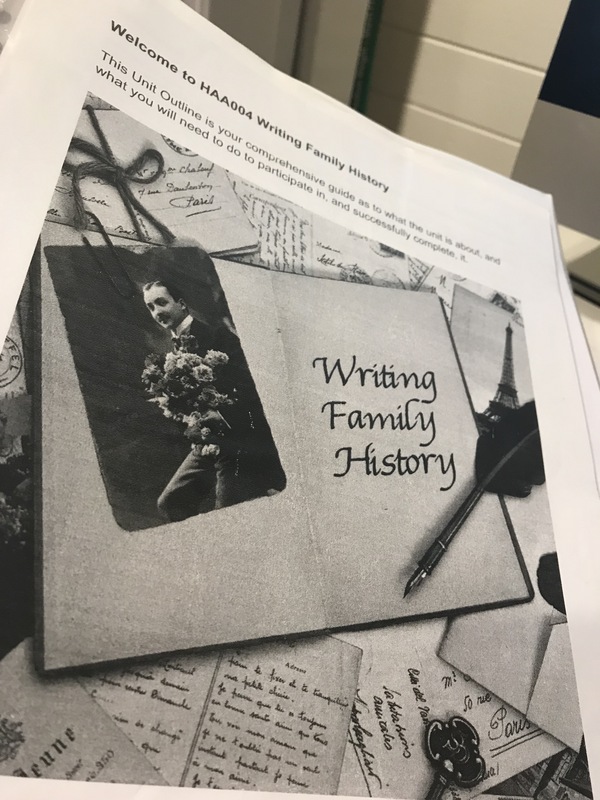 We loved them all! 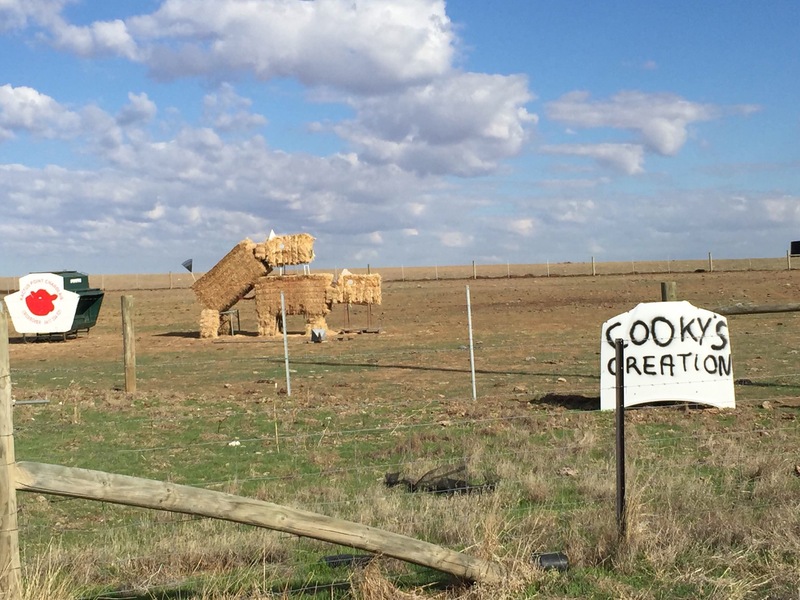 Apparently, the police requested Cooky’s Creation to be dismantled because they had a complaint!!! Another lovely end to the day. The Historic Bridge Seymour spanning the Goulburn River. The Goulburn River is Victoria’s biggest river which flows through New South Wales and Victoria and is part of the Murray-Darling Basin. The Goulburn is 654klms long and begins at Mount Matlock which is situated in the Australian Alps region, at an elevation of 811 metres. It flows into the Murray River at Echua. Today we headed off into town to find a dump point and laundromat. To my surprise, just near the tourist information centre I saw this helicopter in the sky. The wall holds the names of all Australian personel and tracker dogs who served during the Vietnam War. There is also a Remberance Panel listing the names of those Australian personnel who died during the Vietnam War. The grounds also display a tank and an artillery gun. I hope to return tomorrow and spend a bit more time at the Walk. Real wealth is happiness, not fortune. Real poverty is ignorance, not being penniless. Where did that week go? We had a nice stay in Hay NSW. After a few days of 33 deg Celsius the rain came and cooled us down. It was heavy rain and I am sure the farmers had a grin from ear to ear! Although it was a relief from the heat it meant the unsealed road into our camp became so boggy it was closed by the council. So, we had no choice but to sit it out. We were running out of water so we filled the tanks with the offerings from above with a funnel taped to the down side of the awning which was attached to a hose that fed our water tank. We also filled up a couple of buckets with water so we could wash the car when the rain was gone. My new friend Pepe, sent me a pattern to keep my tootsies warm and it just so happened that I had some wool. Below, the end result. Well we left Hay and the Mirrumbidgee River and headed south toward Melbourne. That is our destination to have the caravan serviced and warranty work done on the van. So our first night was at Harcourt Pony Club. Another nice free campsite. Thank you Harcourt, not only for the campsite but the dump point and fresh water. We refuelled and purchased lunch from this friendly town. Stay safe and smile, it costs nothing! Today was an R & R day. We vegged most of the day. Pepe came about 2 ish and we went for an hour stroll along the Murrubidgee, under the bridge and back to our camp. About 6 small motor homes pulled in and parked side by side. They all got out, grabbed their walking sticks and headed for the river an hour later they are tucked in for the night. In front, two motor homes pulled in and parked side by side. A lady and her dog got out of one and a man and his dog got out of the other. What a great arrangement! 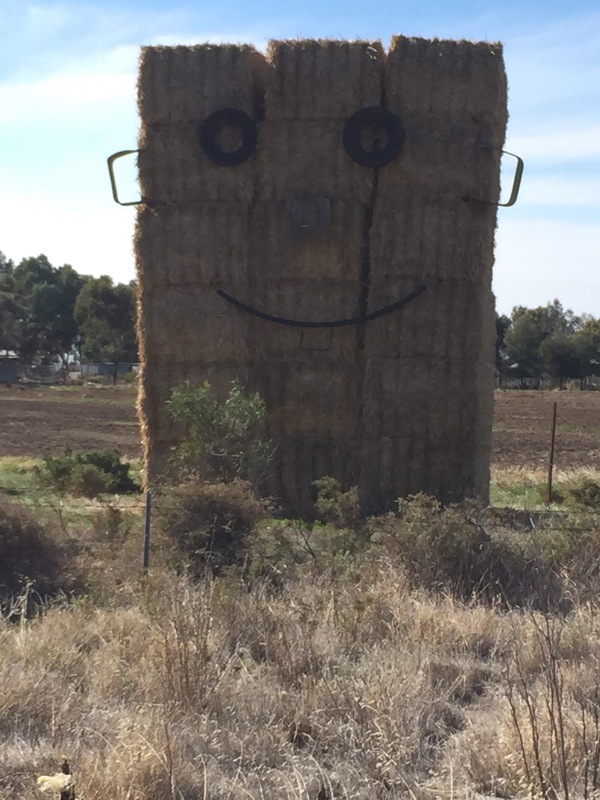 Hay is getting some rain ATM. Supposed to be 33 deg tomorrow. Well sweet dreams and sleep tight.